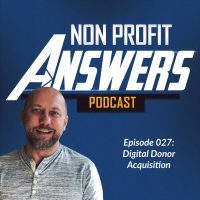 Thank you very much for joining me today on Nonprofit Answers. Today we’re going to talk about something that’s been in the press a lot lately and many brands have been concerned about, and that is the changes to the Facebook algorithm. If you don’t know, Facebook changed their algorithm in early January to really focus on content that is really conversational and important to its users. With this change, many brands have seen a drop in the amount of organic reach or the number of people that their posts are reaching. There was much concern leading up to the change, and there is confusion about what was going to happen. In a kind of a rare move for Facebook, they did a webinar where they explained pretty exactly what they were changing, and so this information has been very helpful for brands to understand how does their social media need to change in order to reach the most people. I think the biggest lesson that this teaches us as nonprofits is that we need to invest in our owned media, we need to invest in our blog and in our email list, and really see Facebook, Twitter, Snapchat, Instagram, all of these social media networks as channels of incoming traffic to your site. Yes, we need to continue being in social media because that’s where our audience is. And yes, we need to continue producing content that is appealing to people and that it encourages comments, shares and likes, but also yes, we need to develop a strategy to push people from social media into our owned media channels like our blog and our email list. So today we have a question from Helen, and we’re going to jump right in and learn a little bit about how the Facebook algorithm has changed and what change that’s going to make for your non-profit. Hi. My name is Helen and I’m the marketing manager at a non-profit in Nashville. I’ve been reading about the Facebook changes and what it might mean to our Facebook posts. Should we continue investing in Facebook? Should I reassign the employee I have to something else? Is there a better social media option? Hi there Helen in Nashville. I love the Nashville area. I’ve spent a lot of time down in Franklin and it’s just a lot of fun to hang out in Nashville. There’s some really great non-profits there in that city and the surrounding area. Really excited to answer this question because there’s been a lot of press about the changes that Facebook has been making to their algorithm. And really, this is kind of a culmination of years and years of reducing organic reach and really trying to force publishers into using their ad platform in order to supplement and grow their audience. Early on in Facebook days, a lot of spent money building an audience, and then over time Facebook just has a glut of content, and as people have engaged less with the content over the years, then they have reduced content that they deem to not be sufficiently popular with their audience. Now we have a situation where, over the last couple of years, organic reach has been dropping, especially for larger brands and, as predicted in 2018, we have what many consider to be a slice off the top of organic reach for brands, for pages, and forcing pages to really look at their strategies on how they interact in social media, what they’re doing in social media, especially specifically in Facebook, come up with some strategies to improve engagement metrics with their audiences. This has been happening for some time, but the exciting thing is this is really an opportunity for your non-profit because as less responsive pages end up in the news feed of people, then if you’re able to really take advantage of creating engaging content, then your posts will get in front of your audience, which is much more exciting than what it has been in the past which is a continual drop in organic reach for brands and to the point that it’s become very difficult to get in front of audiences. And many brands have not changed their tactics, they’re still doing many of the same things that they’ve done over the years, hoping for the best. And what you end up with is just not being able to reach people. The answer is not to only spend some money in advertising, and I do believe that you need a good mix of ad spend dollars within Facebook. The purpose of those ad spend dollars, I would really focus on lead generation and on capturing people and pushing them to your web properties. Also, you need to really rethink how you’re engaging with people, what kind of content you’re producing, because if you’re producing content that is not engaging, that’s not driving comments and shares from your audience, then you’re not really being effective to what Facebook is telling all of us that is content that’s going to work on the platform. I would not say that you need to reassign your staff that are working in social media into something else, but instead to take this as an opportunity to rethink how you are engaging in social media as a brand. How your non-profit is reaching out to your audience and what kind of posts that you’re putting out there. And I’m going to walk through a couple of examples of … Well, first explain what the algorithm change was, and then walk through those examples of what kind of content really does well right now in Facebook. They’re calling this the Meaningful Interactions Update. And basically what Facebook has done is they’ve changed their algorithm for what kind of content is being shown to the audiences. And one of the interesting things that Facebook did with this change was, they’re very vocal and they’re telling people what they did, and there are a lot of times where Facebook doesn’t tell you what they did and they don’t give you a clue into the minds of what they’re asking publishers to do, and instead they leave you guessing for what kind of content is going to work well. And people have found shortcuts where they’ve created content where they ask people to tag other people, or ask people for comments and this kind of content is actually being really suppressed in the news feed right now. Those are the things that people have done in the past, those things don’t work. So you need to create content that really has, as they say, meaningful interactions. So we’re going to walk through how it works, how their algorithm works, and then what kind of content is performing well. There’s some very simple components to the algorithms, four of them. First one is inventory, so that’s all the content that’s available. So for any given person that logs in that’s got 100 friends and dozen or more likes on pages, they’re going to have thousands of posts opportunities presented to them in form of content. There’s no way that anyone can absorb and read and really see all of that content. There’s much more content available than there are eyeballs or people available to see it. Over the years Facebook has really honed in their algorithm on what kind of content each individual person likes and what kind of content they would be most interested in. The first part of the algorithm is how much content is available to be shown to that person. Second are the signals, the considerations about the content that really are kind of the deciding factor of the engagement portion of that. So these are things like comments and shares, and we’ll go into the details of what those things are, but these are the signals of the content. Predictions, so this is the consideration about the person and what kind of content they like. And then the overall score on the content. And so some content, as I mentioned, you know, if you’re asking people to tag other people, that kind of content is going to be naturally suppressed, so it’s going to have a lower score than other content like a Facebook Live event where you’re going to get a lot of comments and shares on those things. So those four key algorithm factors, that’s what provides Facebook a clue as to what kind of content to show to users, and really what they’re trying to drive is a more deeper and meaningful visits on their site. And so they want people to spend more time on Facebook, so they see more ads, so Facebook can make more money. And so in order to do that, the way that they’ve decided to do it is to push down content from the brands that don’t meet these four considerations of the algorithm. So within the algorithm I mentioned the signals. And so signals are the things that are telling Facebook whether or not a piece of content is important to users. And here are some of the signals that affect the content, average time that’s spent on the content. So are people reading it or viewing it or are people spending time on it? If someone is sharing links over Messenger, then that content is more meaningful than other content. If there’s multiple replies to comments on the videos, not only do you have a single comment on there, but people are actually responding to those comments. The overall engagement of the post, so how many people are viewing, clicking, liking, engaging, commenting, sharing the post. When is it posted? The commenting or liking of a person’s photo or status update, and then story type engagement with the publisher’s brands that are shared by friends. So if you have friends that are sharing brands and you’re engaging with those, that’s part of the score. And then how informative the post is. If it’s a very short post, then they may not be deemed as informative as a longer post that gives a little bit more detailed content. There’s what we would say is the active interactions of the signals. The algorithm really focuses on favoring these active interactions. People are sharing links, they’re sharing via Messenger, there’s multiple replies to comments on the video, people are commenting or liking the post, they’re engaging with the publishers and the publisher’s brand post. Facebook is going to be prioritizing posts from people we know, our friends on the platform because we naturally interact with those people more than we do pages. The person to person communication is much more valuable to us, or we’ve demonstrated that to Facebook, than person to brand, or person to page. They believe that because there’s more activity and more engagement and more spark with these person to person posts, that they’re going to show these posts more frequently in your feed. Let’s talk now about what kind of interactions hold the most weight. Facebook breaks these down into active and passive, positive and neutral interactions. So the active interactions are commenting, sharing and reacting, liking and putting a laughing emoji and those kind of things. The passive or neutral interactions are clicking, watching and viewing, or hovering over posts. So Facebook does measure those things. However, they consider those as more passive interactions, whereas the active interactions are going to drive a lot of what the algorithm is showing in terms of content. The very top signal that Facebook is measuring with this update is comments. And so not only is single comments within your post, but also replies to comments on your posts is a signal to Facebook that this content is important to people and will be shown to more people. So Adam Mosseri, who’s the head of the news feed, in the press release he’s quoted as saying, “Page posts that generate conversation between people will show higher in the news feed.” For example, live videos often lead to discussion amongst viewers on Facebook. In fact live videos on average get six times as many interactions as regular videos. Commenting is going to be driving an important factor of the algorithm, and as Adam just told us, Facebook Live videos really drive comments. And this is the first tip that I have for your organization is to find a way to create live videos that drive comments and drive people to comment back to other people on those videos. One of the things that for some time now has been suppressed by the algorithm are what are called Engagement Bait, or trying to get people to engage with their post. So these are things like, “tag someone you know who has a large family” or “comment below your favorite meal for the Superbowl”. Things like that when you put baiting within the post itself, Facebook’s smart enough to know that you’re baiting and they will start to suppress your posts and really damage your page brand’s reach. So these are things that you do not want to do, but instead you want to create posts that encourage people to comment without directly asking them to comment. Sharing is the second most important part of the new algorithm. These are people that … There are people that share links via Messenger or share links on their own page. You know, those two indicate to Facebook that the content itself is valuable. The biggest signal from a sharing perspective is people who share links via Messenger, there’s a lot fewer people who do, and when they share those links via Messenger, they have a tendency to be much more meaningful content and private content between people and thus will provide some more value within the algorithm to posts that are shared via Messenger. However, even though that’s the most important sharing to people’s Facebook profiles, it’s still a very important part of the algorithm. Finally reacting. Reactions are people who not only, you know the little thumbs up, but also who post an angry emoji or a happy emoji. The reactions other than the thumbs up actually hold more weight than just the thumbs up. If you want content that people will react to, whether good or bad, it’s a great way to tell Facebook that this content’s important. Mark Zuckerberg in a recent Facebook post, he said this about reactions. “The research shows that when we use social media to connect with people we care about, it can be good for our well-being. We can feel more connected and less lonely, and that correlates with long term measures of happiness and health. On the other hand, passively reading articles or watching videos, even if they’re entertaining or informative, may not be as good.” And so Facebook’s looking for ways to create opportunities for engagement for the audience, not just to show content to the audience. Here’s what you need to do in order to succeed with these algorithm updates. You really need to focus on the content that’s going to appeal to your audience. And so you don’t need to go broad here as a non-profit, you need to find things that your audience has a passion for. And that’s really easy in one respect because if your audience likes you because they have a passion for your cause, then what you need to do is you need to find things that really generate comments and reactions in people about your cause. It doesn’t have to be about your organization, but really about your cause. In creating this content that creates these meaningful interactions, you’re going to improve your ability to take it into people’s feed. The other thing that a lot of brands are doing, and really I think important for non-profits to look at this year is to create a niche community within Facebook groups, so create an audience in a Facebook group where you can bring together your donors, your supporters and people that have a passion for your cause into one location where they can interact with one another. And so this will allow you to really encourage a community factor that a lot of donors say they’re looking for with a non-profit of being able to connect to other like-minded people who have a passion for the same cause that they have. Helen, I hope this helps. I’m not recommending that you shy away from Facebook at all, in fact now is the time to really dig in because now is a time of opportunity. Now is a time where brands who have not cracked the nut on how to engage with audience, are going to see their reach suffer, whereas brands like yours that can engage in a meaningful way with the people that follow you, that have a passion for your cause, those are the people that are going to really win with this algorithm update. Take care and thanks so much for your question, and good luck as you navigate the process by which you need to do in order to change your content and to engage with more people. Take care. Thank you for joining us on the Non-Profit Answers Podcast. Please take a moment and provide an honest rating and review on iTunes. Your review will help other non-profit leaders find the fundraising answers they need to help more people. Visit us on the web at nonprofitanswers.org.